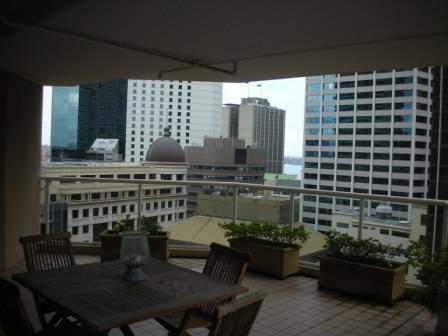 Our APARTMENT is situated in the vibrant heart of Sydney and was built in 2011. It is state of the art and furnished to the highest standard. Sydney does not get any better than this. We also have a luxury BEACHSIDE HOUSE at Sydney's most exclusve beach resort that is available for exchange. Our 2 neighbours at the beach are renovating so the house will be subject to the building related noises during 2012/2013. Just so you know. Two home exchanges are also possible. We have made 65 exchanges and think this is the best way to travel. We can happily provide references and invite you to have a friend visit our properties to see if they would be suitable for you. We reply to ALL requests for dates that are available. We are interested in exchanges of a similar standard and facilities. BOTH PROPERTIES ARE UNAVAILABLE FROM OCT 1-MAY 1 WE NEVER RENT IT. WE DO NOT REPLY TO REQUESTS FOR UNAVAILABLE DATES. IT IS NOT SUITABLE FOR CHILDREN UNDER 14 YEARS. We are looking for upscale exchanges, a minimum of 2 bedrooms and with internet and car if possible. In 2013 we are looking for a scenic destination in the UK, Italy (with pool), Spain (with pool), Manhattan, Chicago and san Francisco. We are not interested in Florida, California (except for SF), Holland, Reunion or Belgium thanks. We are a retired medical couple who love to travel. Your time here need not be synchronous...look at our webpages (link at the bottom of this page)and check the availability calendar and see if we could tempt you. Favourites are NYC, London, France, New England (in the fall) We are a retired NON-SMOKING couple (anaesthetist & academic) with no children. We have done more than 55 fantastic exchanges. 2 things we require when we travel....internet access (preferably with PC access) and 2 bedrooms. We are a 10 minute walk to Chinatown, 15 minutes to Darling Harbour, 20 minutes to the Opera House and all of Sydney's theatres and attractions are at our doorstep. Within 4 blocks in any direction are a hundred restaurants, a huge park, the waterfront, movie theatres, supermarket, a major train and bus interchange and more shops than you could visit in a month. 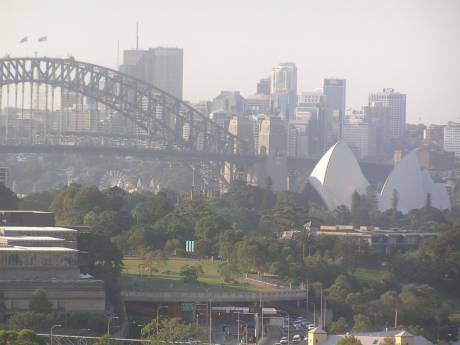 Our apartment gets full winter sun, has breath-taking 270 degree views that take in much of the harbour. 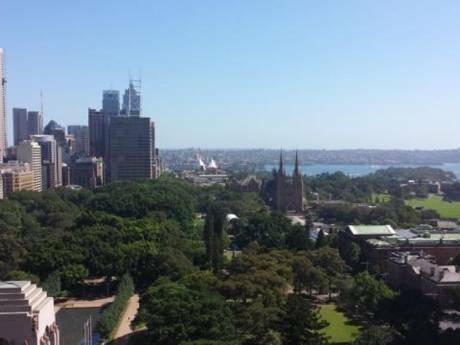 "At the heart of Sydney - Australia's oldest, largest and most diverse city - is the outrageously good-looking Sydney Harbour. Like a psychedelic supermodel, the city curves and sways through this glamorous maze of sandstone headlands, lazy bays and legendary surf beaches. The Sydney experience is essentially physical - dunk yourself in the surf, sail under the Harbour Bridge on a yacht, jog along the Coogee cliff tops or rampage through Centennial Park on horseback. Everybody seems to be outside - the beaches are unforgettable, street cafés buzz and the harbour blooms with sails". Lonely Planet 2010.